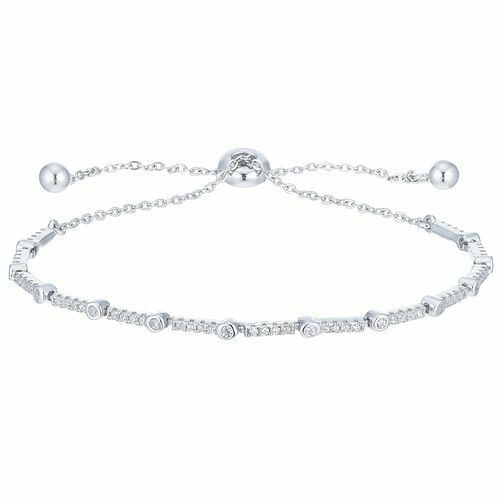 Unique and sophisticated, this beautiful silver bracelet is a charming addition to any outfit, taking you from day to night effortlessly. Features an adjustable fastening and cubic zirconia details. Sterling Silver Cubic Zirconia Adjustable Bracelet is rated 5.0 out of 5 by 1. Rated 5 out of 5 by Anonymous from Simple yet very beautiful This bracelet is just AMAAAAZING!! I purchased it for my friend for her 18th birthday. It’s so simple yet wonderfully beautiful. Amazing for everyday wear!! It was great for my friend who has skinny wrists as the bracelet can easily be tightened or loosened simply by pulling the chain.